The Department of Anaesthesiology manages all the operation theatres (OTs) equipped with modern air handling units. The OTs have state-of-the-art modern anaesthesia machines with facilities for low flow anaesthesia. The department also has various gadgets for the management of difficult airway viz. various types of LMAs, I gels, gum elastic bougies, tube exchangers, fiber optic, bronchoscope, Air traq, Cricothyroidotomy sets, etc. Monitoring devices in the form of multipara monitors, neuromuscular junction monitors (Peripheral nerve stimulator, TOF guard), temperature maintaining devices (Bair hugger warming blanket, IV fluid warmers) are used routinely for all major and supra-major surgeries. Invasive monitoring facilities (CVP line and Arterial line) are also instituted in indicated cases. Monophasic and biphasic defibrillator with facilities of AED and transcutaneous pacing are also available. The department practices a wide range of regional anaesthesia techniques encompassing central neuraxial blocks like spinal, epidural, combined spinal epidural and peripheral nerve blocks using nerve locater and/or ultrasonography which improves the quality of block, thus, minimizing the rate of complications. Perineural catheters are used for continuous anaesthesia and post-operative analgesia. Recovery room facilities are available to observe and monitor the patients post-operation. The department runs a daily OPD for the assessment of patients pre-operation to stratify their risk and to optimize them thereafter. Services for deep sedation and/or anaesthesia with the required monitoring are provided to Radiodiagnosis Department for CT Scan, MRI & USG for diagnostic and occasionally for interventional procedures. Similarly anesthesia and sedation services are provided for cancer patients requiring procedures like interstitial brachytherapy and radiotherapy. Pain clinic is conducted as daily OPD where primarily patients of chronic pain, cancer pain and even acute pain are referred by various others specialties like General Surgery, Obstetrics & Gynaecology, Skin & Veneral Diseases, Medicine and Oncology, etc. Patients are treated using multi-disciplinary approach with help from physiotherapists, psychiatrists, psychologists and neurophysicians. Drugs like injectable Morphine, Fentanyl lollipos–transdermal patch, Gabapentine, Pregabaline and various combination drugs are available for the treatment of various types of pain. The Department also practices interventional procedures like neurolytic blocks, epidural steroid injections, etc. Acute pain services are provided by the Department to post-operative, burn and trauma patients in hospital using continuous epidural, perineural and patient-controlled analgesia catheters and multimodal drug therapy. Labour analgesia is also practiced in a protocolized manner on request by the Obstetrician in indicated cases and on demand by the Parturients. Various educational programmes are conducted by the department for the nursing staff to increase awareness of pain as the fifth vital sign. The Department is responsible for the resuscitation calls, especially in polytruma cases in Trauma Centre and providing anaesthesia for emergency surgeries in the Trauma OT. The shifting and transport of critically ill patients in the ambulance is also entrusted to anaesthesiologists. The Department has played a major role in formulating the 'Code Blue' Team of the hospital which caters to any calls for resuscitation within the hospital campus. The Department also manages surgical ICU. All the ventilatory and haemodynamic monitoring and managrment is done using modern technology. Procedures like central venous cannulations using ultrasonography, arterial cannulations, percutaneous tracheostomies and thoracic epidural catheter placement for fracture ribs or for post-operation pain relief are performed routinely. The Department has adequate number of qualified and experienced faculty members..The department runs a MCI-recognised postgraduate programme since 1998 with the intake of three degree and six diploma seats every year. The postgraduate students are given a wide exposure to all the surgical branches of anaesthesiology including cardiac, neurosurgery, plastic, urosurgery, paediatric, laparoscopic, vascular, onchosurgery, etc over and above the basic training in general surgery, orthopaedics, obstetrics & gynaecology and ENT. BMPCC provides Cardiac Surgery and Cardiology services. 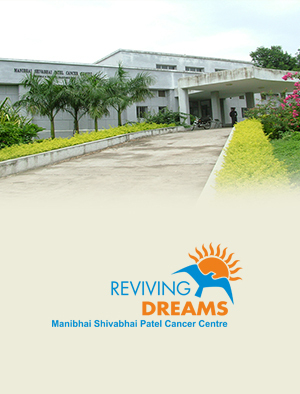 It is equipped with all modern facilities and infrastructure needed for quality cardiac care. The cardiac surgery department includes two well equipped cardiac operation theatres. The major features of operating suites include linear air flow, remote-controlled OT-tables, Drager Fabius GS Anaesthesia Machines with Ventilators and Monitors, Cardio Pulmonary Bypass (CPB) Machines, Trans Esophageal Echocardiography machine, Intra Aortic Balloon Pumps (IABP), latest surgical instruments and all disposable gowns and drapes for patient care and safety. Cardiology care includes a state-of-theart Flat Panel Cath Lab for Angiography, Angioplasty and Cath procedures. BMPCC offers cardiology services like Pacemakers, Device closures and Coil closures for various adult and paediatric cardiac ailments. The centre has 8 -bed Post Operative Intensive Care Unit (ICU) having infant warmers, ventilators, monitors, IABP, Pace makers, Nitric Oxide delivery system ,etc. The staff in ICU and OT are well-trained to take care of neonate, paediatric and adult cardiac patients. 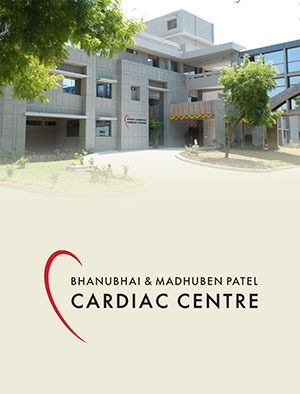 BMPCC also has 8 -bed well-functioning Coronary Care Unit (CCU) for immediate treatment of emergency cardiac patients. The facilities in the CCU include emergency treatment for myocardial infarction (MI), Thrombolysis, Temporary Pacemaker Insertion (TPI), IABP, monitors and ventilators. In addition, variousoutpatient facilities like Electrocardiography, Trans thoracic and Trans esophageal Echocardiography, Tread Mill Test (TMT), Holter Monitoring, etc are also available. General Dentistry (Esthetic fillings, Root Canals, Extraction, Scaling, Reimplantation). The Department emphasizes on rational clinical practices. The Extension Centers at Agas, Petlad, Bhadran and Sevaliya are equipped for General Dentistry work. Traineeship (Stipendary/Nonstipendary) for 3 months including 6-days module are also offered to empower the interested candidates in comprehensive care in Oral Surgery, Prosthodontia and Endodontia. A certificate is issued on successful completion of the course. "To be an outstanding department in the field of medico-legal work and strive to prepare future medical practitioners being self-reliant in handling medico-legal issues"
The Department has a well equipped mortuary and conducts good number of postmortems per year. It assists medical officers in dealing with medico-legal cases time-to-time. It is also involved in examination and certification of disability and sexual offense cases. Round-the-clock guidance on medico-legal issues at institutional level is provided by the Department. Government Medical Officers and Police Officers receive consultancy services from the faculty 24hrs. One of the faculty members has started a medico-legal Helpline for registered medical practitioners involving medico-legal issues namely www.medico-legalhelpline.blogspot.com. The site has been well appreciated by peers. We take pride in stating that we are one of the handful departments in the country where undergraduate students are taken to District Courts for live courtroom experiences that give them first hand exposure and also help them in building confidence as a medical expert witness. The Department has always been striving hard to achieve excellence in the subject of Forensic Medicine & Toxicology. The faculty is actively engaged in teaching of undergraduate students and students of allied courses like Ayurveda, DMLT and Forensic Science. The Department has introduced OSPE for formative evaluation in between the internal exams. As a valuable learning resource, the Department has its own library comprising of more than 100 books containing standard text books and reference books; time to time replaced with latest editions. Online access to e-journals is also available. The Department has a well-equipped, excellent museum comprising of soft tissue specimens, bones, poisons, weapons, photographs, radiographs and mannequins with labels and catalogues. The faculty of the Department research-oriented and has been constantly engaged in research activities. Faculty members have contributed more than 50 publications in State, National and International Journals. Two of them are on the Editorial Board of National and International Journals too. They have also been recipients of Best Paper Awards at various conferences. At present, many research projects with approval from Institutional Research Ethical Committee are ongoing in the Department, addressing need of the society in different perspectives. The Department is also involved in conducting CME/ Workshop. In 2010, it conducted a State-level CME for medical officers who are the backbone of our medico-legal system. The Department has excellent infrastructure for academic programs and presentation facilities with access to 24-hours internet services. Academic programs including seminars, case discussions and journal clubs. are conducted The Department participates actively in the institutions' PG programs like, Monthly Mortality Review, Medical Audit, Involve Academic Meet AND Interdepartmental meets. It also participates in handling the post-exposure prophylaxis for health care workers following needle stick injuries and Pharmacy and Hospital Infection Control Program. The Department is also a pioneer in establishing antibiotic stewardship program in the Hospital. Maintains impeccable record of comprehensive patient care, teaching and training of students as well as contribute significantly to the scientific literature in terms of research. Neuro-rehabilitation services are extended in collaboration with physical medicine and rehabilitation department at Physiotherapy College of CAM, which includes physiotherapy, occupational therapy and vocational guidance. Evaluation and diagnosis of Various Parkinsonian plus Syndromes including Progressive Supranuclear Palsy, Multiple System Atrophy, Corticobasal Ganglionic Degeneration. Works closely with Neuroradiology, Neurosurgery, Pathology, Biochemistry, Microbiology, and all other departments in addressing various diagnostic and therapeutic problems. The Department of Obstetrics & Gynaecology is dedicated to women's health. It looks after out-patient department, inpatient department, labour room and operation theatres over and above extension service program for pregnant women at Ardi, Petlad, Bhadran and Sevaliya. The Department receives complicated pregnancy and delivery cases alongwith critical patients who are treated in ICUs with facilities of artificial ventilation, dialysis, etc. Patients of pregnancy complications are given blood component therapies in the Department. The antenatal OPD carries out an innovative Janani Krupa programme for pregnant women which is a holistic programme that covers complete care of pregnant women. The gynaecology OPD takes care of problems like gynaecological infections, menstruation problems, infertility, menopause and cancer. The Department also runs a family planning program and is recognized for training the doctors for laparoscopic family planning operations. The Department of Opthalmology provides tertiary eye care services in addition to primary and secondary eye care. It is well-equipped with autorefractometer, automated perimeter, A-scan biometer (to measure IOL power), slit lamps, Nd:YAG laser, anterior segment imaging system, fundus camera and frequency-doubled Nd:YAG laser for treating retinal diseases. It also boasts of a registered eye bank where collection of eyes and keratoplasty is performed. The OT is well-equipped with state-of-the-art technology and equipment such as Zeiss operating microscope with CCTV, phacoemulsification machine and virectomy machine. Surgeries like phacoemulsification (surgery without injection and eye-patch) with monofocal or multifocal IOL implantation, retinal surgeries, vitrectomy, anti-glaucoma, squint, oculoplasty and DCR are performed by well-qualified and experienced ophthalomologists. The Department of Orthopedics has three well-equipped operation theatres with laminar air flow system. There are two C-arm IITVs for trauma, spine as well as other complicated reconstructive surgeries. There are equipments such as pneumatic as well as electric drills, power saw, pulse lavage system and other modern equipment required for modern age trauma surgeries. Apart from trauma, spine surgeries, joint replacement, deformity correction and re-constructive surgeries, etc, are routinely performed by the Department. The Department of Paediatrics is a well-developed clinical department with routine OPD/Indoor services (including well equipped NICU/PICU) as well as regular outreach activities. The students are exposed to the discipline of paediatrics in second and third MBBS. In addition, the PG students are given duties in rotating manner between NICU, PICU, Paediatrics Ward and OPD. The undergraduate training programme is divided in to two components of 4 and 8 weeks respectively during second and third MBBS. During the first paediatrics term the students are given basic orientation and some clinical exercises focused on skills. During the second paediatrics term, a two-weeks' modular training on IMNCI is incorporated which is conducted in co-ordination with the PSM department. Subsequently, a one-week skill based module on ENBC (Essential Newborn Care) has also been introduced. During the clinical terms, daily clinics are taken regularly for the UG students. All the PG Students are involved in clinical UG Teaching. For each batch of the undergraduate students weekly two theory lectures in paediatrics are taken on regular basis. Participation in important National Health programmes like Pulse Polio Immunization and Surveillance, Promotion of Breast-feeding, National Newborn Care Week, etc. The Department also organizes regular training programmes like Pediatrics Advanced Life Support (PALS), Neonatal Advanced Life Support (NALS) and Childhood Asthma with the support from the Indian Academy of Pediatrics and National Neonatology Forum. The Department has carried out a pilot project titled 'Mental Health for school going adolescents' for the Government of Gujarat (GoG) in 25 schools of Anand district. The department is very actively involved in a new initiative of the GoG – Tapovan, which aims at holistic care of women and children during perinatal period. All the faculty members and some of the residents have already attended the state level TOT on IMNCI and FIMNCI. 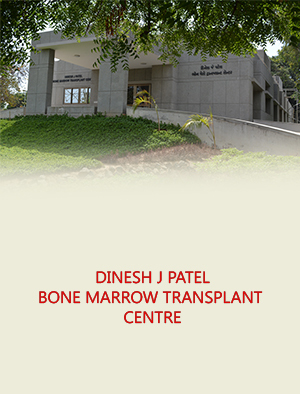 PSMC is a recognized institution for IMNCI training. The Department has three full time professors, one full time associate professor, two full time assistant professors and a very senior and reputed professor emeritus who have some important publications to their credit. Thus, the Department of Paediatrics is truly developing as a comprehensive child health care department. The Department of Pharmacology aims to inculcate a rational and scientific basis of therapeutics and promote the use of essential drugs and Rational Drug Therapy. The students at any level become proficient in various aspects of drugs and should acquire skills in Rational Prescribing. The department is involved in teaching various courses, viz, MBBS, MD (Pharmacology), BPT, MPharm (Clinical Pharmacy) and PhD in Pharmacology. The departmental staffs are also engaged in teaching Bioethics at the level of MBBS, Post Graduate Medical Courses and Medical Laboratory Technology Course of Sardar Patel University. The Department has two laboratories for undergraduate teaching, a postgraduate laboratory and a research laboratory along with a clinical pharmacology unit - all of which are fully equipped for experimental pharmacology and research activities. Though the Department is primarily involved in teaching and research activities, the faculty also actively participate in the activities of the hospital pharmacy, medicine bank, human research, ethics committee, institutional animal ethics committee, medical education unit and community extension. The Department is also a peripheral centre of National Pharmacovigilance Programme of India (a Government of India undertaking) - one of the 24 centres across India and one of the only 2 in Gujarat. The Department is committed to the promotion of essential medicines and rational use of medicines in clinical practice, which is well reflected in all its activities, teaching and research programme. The departmental museum is also developed on the essential medicines concept of the WHO. The manual of practical pharmacology developed by the faculty for MBBS students is well-acclaimed. A well-structured teaching programme is astutely followed. Faculty and post graduate students of the department present and publish several research papers at the state, national and international level. Faculty are also involved in guiding undergraduate students in ICMR Short Term Training program. The Department of Physiology is primarily involved in teaching of various healthcare professional courses being offered by PSMC and applied human research. In case of undergraduate training of MBBS, BPT, and BSc (MLT) students it follows an integrated curriculum. It has adopted a number of student-centric methods for imparting education, viz, Student Group Seminar, Case Based Learning, Project Based Learning, ICMR Short-term Studentships, online education, etc. It has been the pioneer in the state of Gujarat in organizing State and National Inter-Medical College Physiology Quiz Competition in the year 2006 and 2010 respectively with the objective to foster interaction and relationship between students of various colleges from across the nation. Apart from academics, the Department also emphasizes on communication skill, emotional and spiritual quotient by organizing regular evolve meetings. It has also adopted OSPE, Case-based Questions and Objective structured Viva in formative and summative assessment of MBBS students. The Department has also evolved as a PG department and offers MD (Physiology) and PhD (Medical Physiology) programs. Apart from these, the Department offers training as an integral part of the Master of Industrial Hygiene course being offered by Sardar Patel University in collaboration with the University of Cincinnati, USA. The Department consistently publishes scientific papers in national and international journals and the research work has been recognized and appreciated by peers from across the globe. The faculty members have been invited as speakers at various scientific conferences and have been appointed as reviewers and board members in national and international scientific journals. The Department of Psychiatry provides clinical outdoor service and indoor admissions for indicated patients. There are services provided in the Consultation-Liaison Psychiatry to the other departments in the Hospital. In community outreach programs the Department runs the "Tobacco Cessation Program" funded by the WHO in collaboration with the DEpartment of ENT since 2001. Now it has been recognized as a Nodal Centre for training other centers. The consultants from the Department visit the centers adopted the CAM. They also act as visiting faculty in different colleges under the Charutar Vidya Mandal. The services given by the Department include addressing Adult Psychiatric disorders, Child and Adolescent Psychiatry & Geriatric Psychiatry, Psycho-sexual disorders and De-addiction services. The Department plays an active role in helping school and college students to deal with exam stress and has started a help line for the same. The Department is well-equipped to carry out test for the IQ measurement and assessment of personality problems of patients. Facilities like ECT and EEG is routinely carried out here. The Department also runs Child guidance clinic, Memory clinic and Psycho-sexual disorders clinic. The faculty at the department is actively involved in research. A pulled muscle. Chronic backache. Severe neck pain. 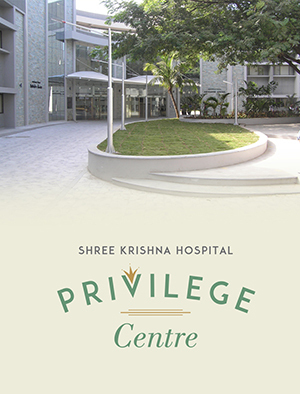 At Shree Krishna Hospital, we understand that physiotherapy plays a vital part in pain relief. Our qualified team of physiotherapists and advanced facilities for pain management and sports medicine ensure that you win the fight against pain. Every time. The Department of Respiratory Medicine diagnoses and treats patients of tuberculosis in accordance with the Revised National TB Control Programme (RNTCP), under which investigations and treatment are given are free of cost to the patients. The Department is actively involved in the activities related to RNTCP at State and National level. Camps are being conducted regularly at Sakkarpura, Khambat for patients of silicosis. The Department has a wellestablished pulmonary function test laboratory (PFT lab). With the availability of a portable spirometry machine the service is also avilable at various subcentres of the Hospital – Petlad, Shree Krishna Health Centre, Khambhat and also on the bedside for critically ill patients. Additionally the Department is equipped with a flexible Fiber-optic Video Bronchoscope, the use of which has helped in the diagnosis of many a cancer patients. The Department is well-staffed with senior and experienced faculty. There 40 beds with indoor facilities which include ICU beds for critically ill patients. There is an equal emphasis on UG and PG teaching. The Department of Surgery has fully-equipped operation theatres with laparoscopic equipment, laparotomy set, ventilators & cardioscope with defibrillator, pulse oxymeter, etc. Diagnostic and therapeutic endoscopies are performed under the endoscopy clinic which is equipped with state-of-the-art video endoscopes, gastroscopes, colonoscopes and side viewing duedenoscope. Additionally there are sophisticated equipment for Neurosurgery, Urology, Vascular surgery, Onco surgery, Plastic surgery and Paediatric surgery. A 12-bedded Surgical Intensive Care Unit (SICU) takes care of the critically ill surgical patients. In addition there is 7-bed intermediate medical care unit. The Trauma Care Centre under the Department is well-equipped with modern equipment. The Department is actively involved in the organising national and international workshops. One of our faculty member has also published a book on procedures for undergraduate students. The Department of Skin and Venereal Diseases is well equipped with all necessary equipment like mechanical dermabrator, electrocautery, microscopes, equipment for punch biopsy and other minor surgical procedures and cryosurgery. The faculty at the department runs a STD Clinic and Leprosy clinic, both of which are supported by the Government of Gujarat. There are separated wards for patients with Leprosy and HIV-AIDS. The faculty at the Department perform various cosmetic surgical procedures like suction blister, skin grafting and punch grafting for vitiligo. Epidermal cyst excision, mole excision, electrolysis, acne scar revision and chemical peeling are the other procedures which are routinely performed. The Department also has at its disposal CO2 Laser for treatment of various dermatological disorders.